I don’t know about your house but in my house at meal times I often hear that delightful refrain from my kids of “Yuck, I’m not eating that!” This is particularly true when vegetables are involved. 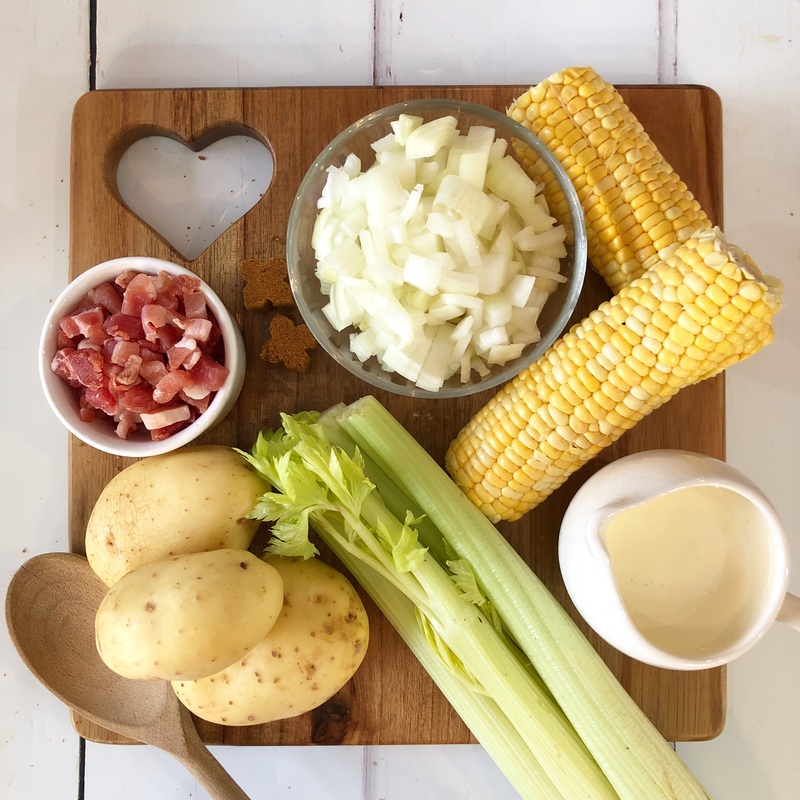 There are not that many meals that everyone in this house enjoys with no complaints whatsoever but my Sweetcorn Chowder is one of them and for that reason it is, as far as I am concerned, the best Sweetcorn Chowder recipe ever. I can be sure that whenever I make this, there will be no complaints at all, just happy faces and full tummies. I don’t remember where this recipe originally came from but I am sure it was inspired by something I read or saw somewhere. I have been making it for so long now that I tweak it from time to time or add something extra now and then, but the basic ingredients and quantities stay much the same. The recipe below is just how I make it, timings may be different depending on your cooker. I have been known to substitute bacon for pancetta and have used milk when I have had no cream. 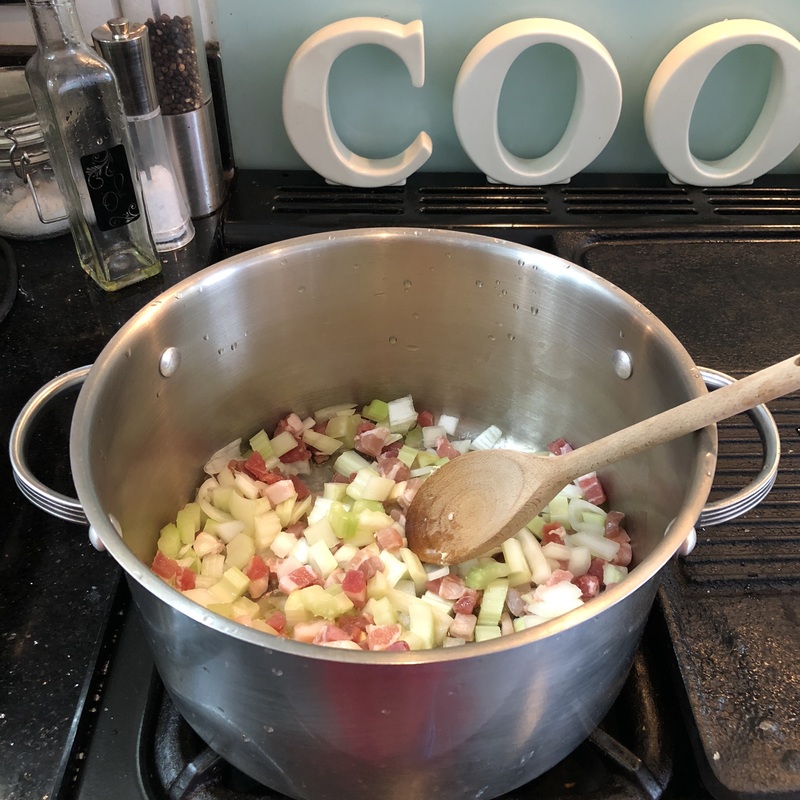 Put the onion, celery and pancetta into a large pan with the knob of butter (or oil) and sweat it slowly over a medium heat until the onion and celery have softened and the pancetta is starting to change colour. I usually do this with the lid on and check it regularly. It takes about 10-15 minutes. If it looks like it is starting to stick I add a little water to stop it. 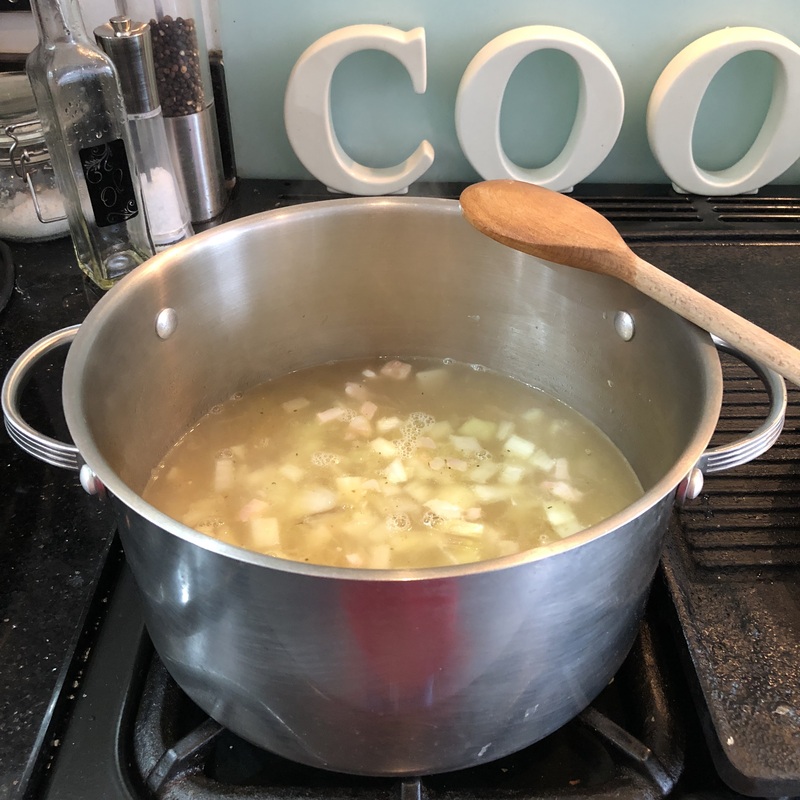 Once the onion and celery have softened I make up the vegetable stock cubes in a litre of boiling water and add it to the pan. I turn up the heat and leave this to come to the boil and then I add in the potato. 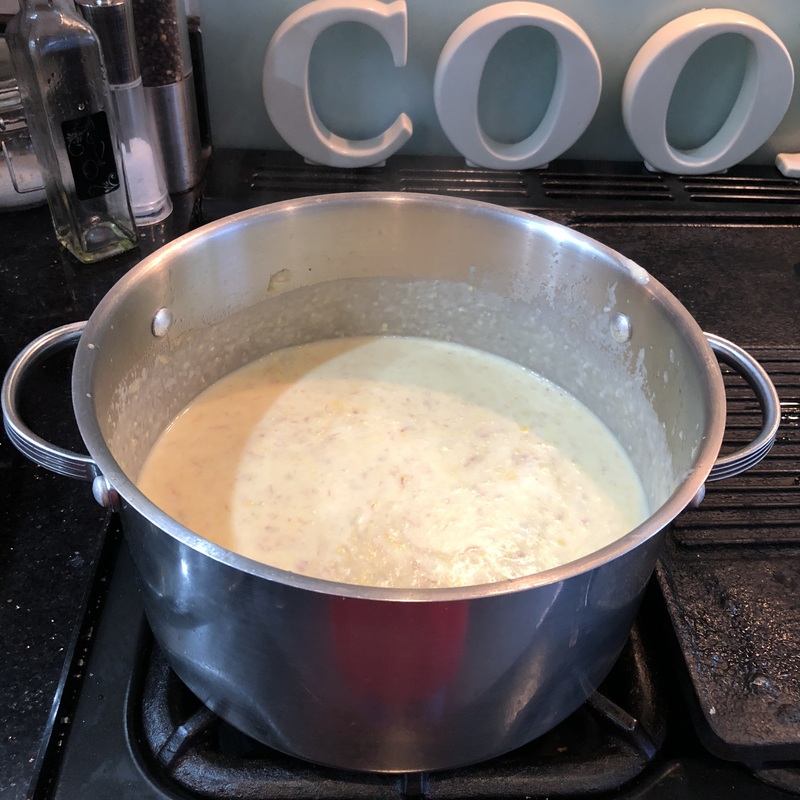 The potato acts as a thickener so if you like thicker soup you might want to add another and if you like thinner soup you might want to use one less. Trial and error is how I ended up adding 3 potatoes, as we like our soup quite thick. Turn down the heat slightly and continue to cook until the potato is soft. While the soup is cooking prepare the corn on the cob by stripping the kernels off the cobs. If you are using frozen sweetcorn you won’t need to do this step. 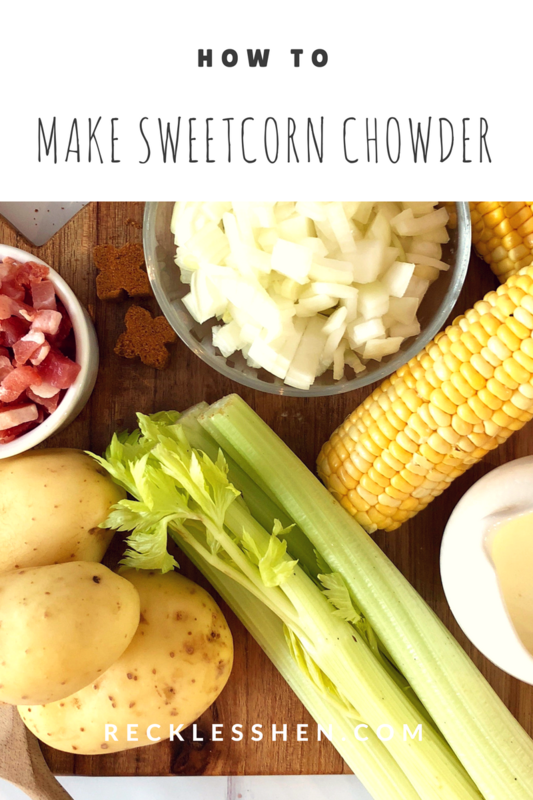 Once the potato is soft add the sweetcorn and continue to cook for another 10 minutes. At this stage you can add a little more boiling water if required. 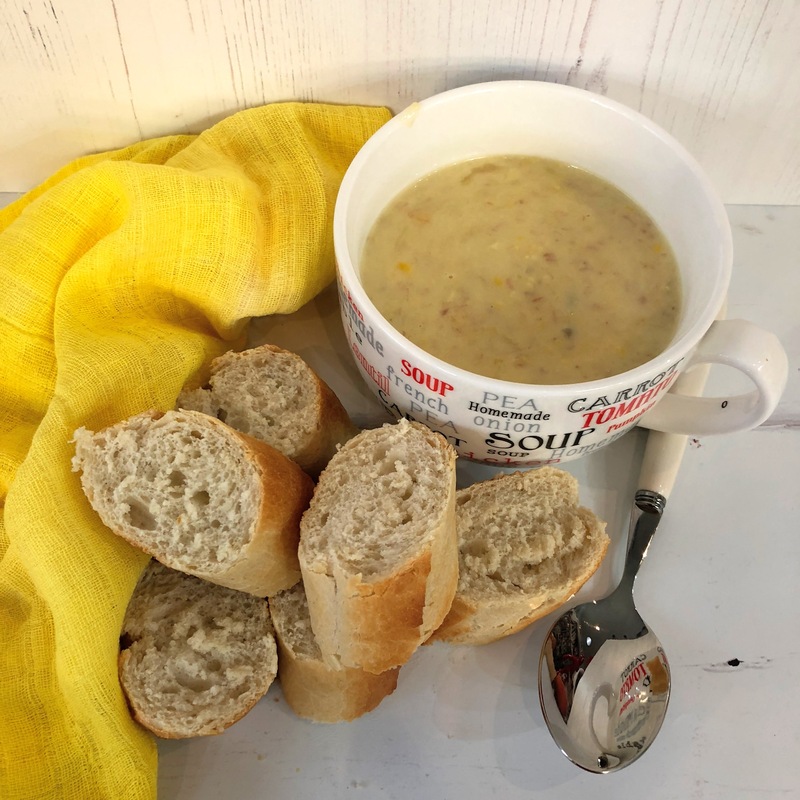 Take the soup off the heat and use a handheld blender (or you could use a jug blender) to blend the soup until it is a consistency you are happy with. 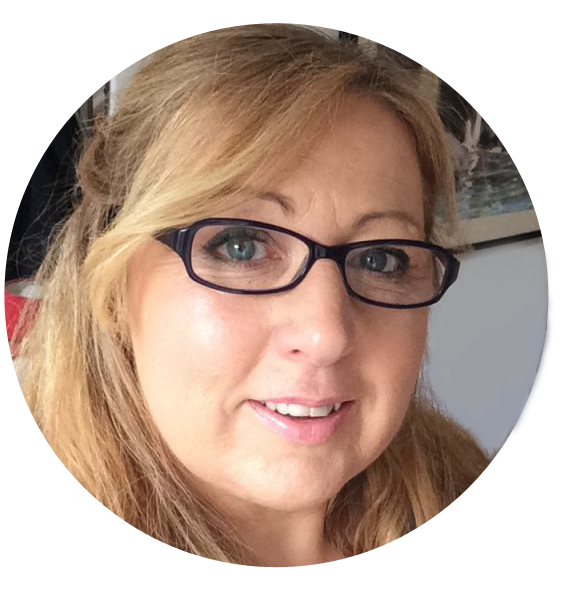 We like ours quite chunky but I know other people prefer it smoother so you can blend it as little or as much as you like. I do recommend that you do this very, very carefully as more than once I have ended up splattered with boiling hot soup. Once it has been blended I put it back on the cooker, add the cream, heat it through for a minute or two and it is ready to serve. We like ours with heaps of crusty bread just out of the oven. I often buy those packs of bread that are ready to bake but equally often I just buy a french stick or some other crusty loaf and heat it up. I hope you can follow this and it turns out delicious. If you use the recipe I’d love to know.